A Printer that Delivers 1,000 Pages a Minute? A schematic of the printer head design (side view), showing the ink micro-reservoirs, nozzles, and wiper. Two researchers from The College of Judea and Samaria in Israel have designed an ink-jet printer head that could lead to printers capable of chugging out 1,000 pages per minute – or even more. The innovative printer head created by engineers Moshe Einat and Nissim Einat works in a similar way as a liquid crystal display (LCD). But while an LCD emits tiny pixels of light, collectively forming the picture on your laptop or television, their print head emits pixels of ink. Their basic design is small, but it can be reproduced and the copies combined into one large printer head. Current ink-jet printer heads work by channeling ink from a main reservoir to a series of nozzles, which are negatively pressurized to eject equal-sized ink drops. But when the number of nozzles increases, the pipe manifold connecting the reservoir to the nozzles becomes complicated and stable ink-flow conditions are harder to maintain. For example, shock waves in the ink can create “cross-talk” problems between nozzles. Another issue is the drop-ejection rate, which must be limited in order to mainstain system stability and print quality. This, in turn, stunts the print speed. The motion of standard print heads presents additional problems. Two full (and two partial) segments of the actual printer head matrix. “Our design avoids these physical limitations,” said Einat. The design's building block is a micro-reservoir of ink that feeds four nozzles. 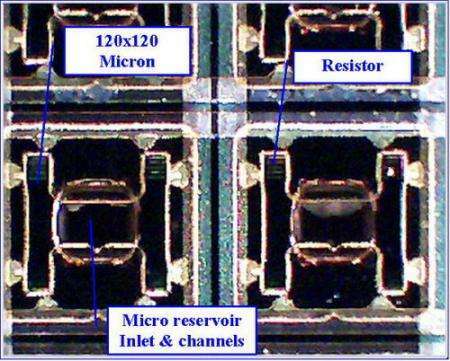 The reservoir is square, one millimeter (mm) on each side, and is 0.5 mm deep. The ink enters the nozzles via capillary action (the way water naturally creeps up a plant stem, for instance). To refill, an ink-coated “wiper” slides over the top of the reservoir, depositing a layer of ink. The small amount of ink in each reservoir and the natural capillary force between the ink and the reservoir walls make pressure regulation fairly simple. Einat and Einat combined many of these basic stand-alone segments into a 12x12 cm2 printer head matrix with a total of 57,600 nozzles. They subjected it to several tests to confirm proper ink flow within the system. For more information about this research, see the published paper in the August 15, 2006, online edition of Applied Physics Letters. This could lead to warthog printers that can "Clear a Savannah after every meal".